X-TAIRMINAL is a recently developed complete control and monitoring system for TROX components. 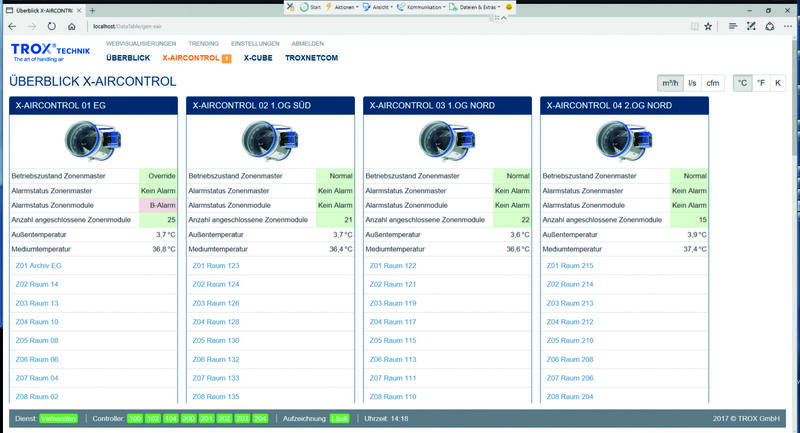 It allows users to monitor all components of ventilation and air conditioning systems and to display all parameters and status values on a screen: information on air handling units, volume flow controllers, room controllers, sensors, and fire and smoke protection equipment, all at your fingertips! This total overview ensures that airflows can be quickly adapted to demand and that systems can react quickly in case of an alarm. The first ever X-TAIRMINAL system has now been installed in the Piding STYLES Hotel, in the Berchtesgaden region near the German-Austrian border. As early as in the design stage the focus was on a pleasant indoor climate such that hotel guests would feel comfortable. Air management and fire protection were of particular importance to the budget design hotel owners. The specialist consultant favoured a complete solution from a single source. For air management, building owners and specialist consultant decided to have two X-CUBE air handling units. The included RM-O-3-D duct smoke detector provides safety as it sends control input signals to fire dampers and smoke protection dampers such that in the event of a fire the spreading of smoke via the ductwork is prevented. X-TAIRMINAL allows system owners to monitor energy consumption and system operation in general at all times, and to see trends that might be used to adapt parameters. The user interface can be navigated with a web browser, which allows for changing operating modes and variables independent of the central BMS. Alarms are always issued together with information on the location of a fault such that immediate action can be taken in case of an emergency. Several TROX systems have been implemented in the Piding STYLES Hotel, including TROXNETCOM and X-AIRCONTROL. X-TAIRMINAL, the complete overall system, helps users to stay in control of the large number of installed controllers, fire dampers and sensors. X-TAIRMINAL is an intelligent system for the project-specific configuration display of ventilation and fire protection systems; it is particularly recommended for small and medium-sized projects. X-TAIRMINAL allows users to control all functions and measured values, but also to make changes. Anywhere, anytime. X-TAIRMINAL allows users to display and analyse all parameters for a ventilation and air conditioning system, for example to recognise trends. Piding STYLES hotel in the Berchtesgaden region of Bavaria. (Photo by STYLES Hotel Piding GmbH). TROX is leading in the development, manufacture and sale of components, units and systems for the ventilation and air conditioning of rooms. With 27 subsidiary companies in 27 countries on 5 continents, 14 production facilities, and importers and representatives, TROX is present in over 70 countries. 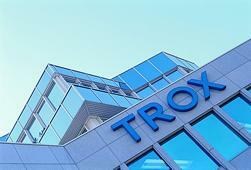 Founded in 1951, global market leader TROX, whose international head office is in Germany, generated in 2016 with a total of 3,700 employees around the globe revenues of nearly €500 million.